One of my favorite parts about helping lead My Place Realty is having the opportunity to work with such talented people. Seeing my team members serve their communities while striving towards our four core values of respect, accountability, forward thinking, and being one team always puts a smile on my face. Recently, one of our MPR team members was recognized for her hard work. I would like to extend my most sincere congratulations to our resident manager Grace Czarko! 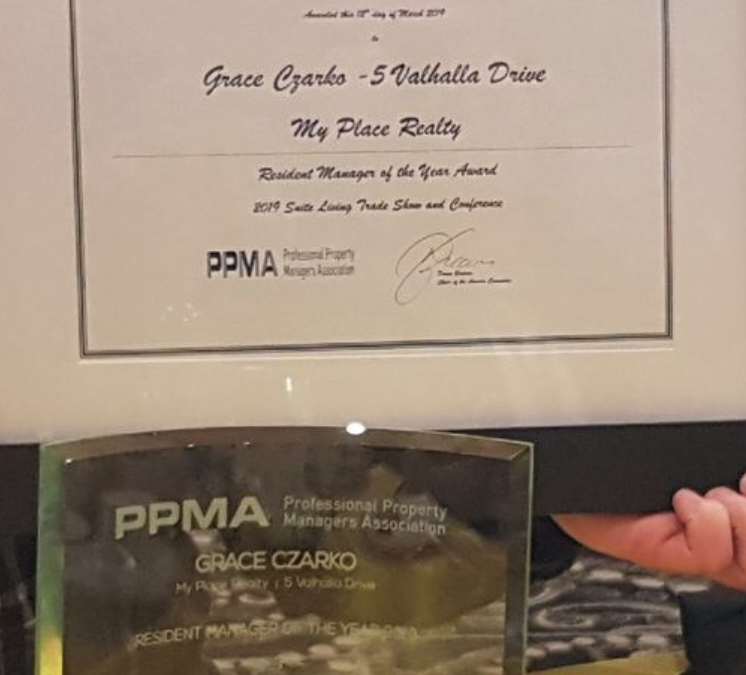 Grace was named 2019’s Resident Manager of the Year by the Professional Property Managers Association, based in Winnipeg. As the resident manager of River East House, a 47-unit complex located at 5 Valhalla Drive, Grace has made her tenants’ lives better for over 20 years. Grace’s strong work ethic is easy to see in the way that she tackles tasks like snow removal, lawn tending, cleaning, leasing, and tenant relations for her entire property. Ensuring that the building is clean, tenants are safe, and the office knows about issues straightaway are always top priorities for Grace. In fact, River East House is one of My Place Realty’s quietest buildings thanks to Grace’s hard work. She strives to nip problems in the bud and prevent as many issues as she can. With so many properties to manage, I certainly appreciate her efforts! I feel pride towards each of my team members every day but I had to give her a special shout-out today. Her kind nature, incredible work ethic, and unmatched customer service skills make her indispensable to the MPR team. Congratulations again, Grace, and keep up the good work!